In January, 1920, 18-year-old Ben Shlyen of Kansas City published a slim 8-page volume for Missouri film exhibitors. He titled it The Reel Journal. The weekly quickly expanded its Midwestern reach, with regional editions published each Saturday at every compass point. 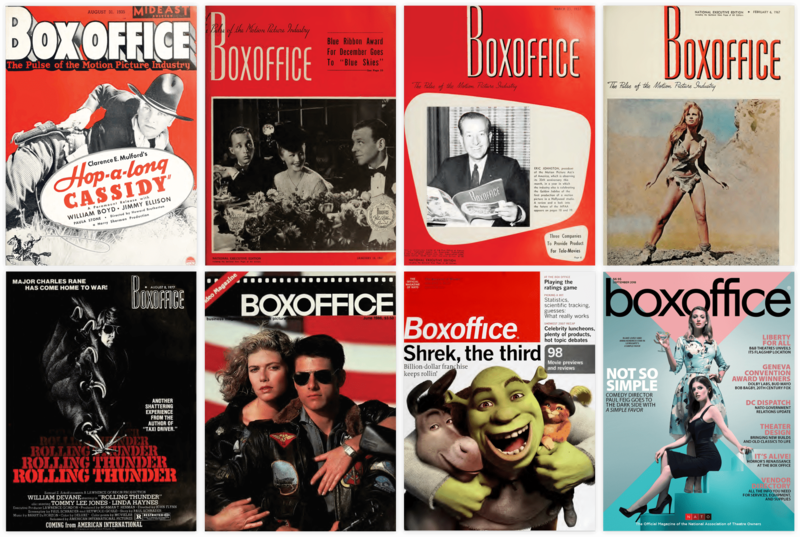 In 1933, Shlyen combined his nine small magazines into one national brand—Boxoffice. From teenage brainstorm to national prominence, Boxoffice has continued to be the leader in exhibition reporting, covering industry innovation and cinema trends. Yet at its very heart Boxoffice is about the movies. As we approach our 100th anniversary, Boxoffice continues to commit to our young founder’s original pledge—to reflect the pulse of the motion picture industry. To our sponsors and advertisers, Boxoffice is your destination for delivering your message directly to your partners, customers, and prospects. As the official magazine of the National Association of Theatre Owners (NATO) and to the leading exhibition conferences, conventions, and shows, no other publication or digital platform reaches more industry decision makers and influencers. Film Journal International first launched in 1934 as The Independent, a local newsletter edited by George Rudnick and Lionel Toll and promoting the interests of the New York-based Independent Theatre Owners Association. In 1946, ITOA executive director Morton Sunshine took over as editor and the magazine changed its name to The Independent Film Journal, expanding to nationwide coverage. Mort was succeeded as publisher/editor in 1975 by his son Jerry. Mort’s son Robert took over in 1979 and remains publisher/editor to this day. Under Robert’s leadership, the magazine modernized its look and was renamed The Film Journal, as its coverage was no longer limited to independent exhibition. In 1996, the magazine took on its current name, Film Journal International, reflecting the dramatic growth of worldwide theatre exhibition. Robert Sunshine and his nephew Andrew are also the directors of three major industry conventions, ShowEast, CineEurope and CineAsia.